For the last twelve years I’ve driven through Moorestown, New Jersey, only to be taunted by an amazing doorway. 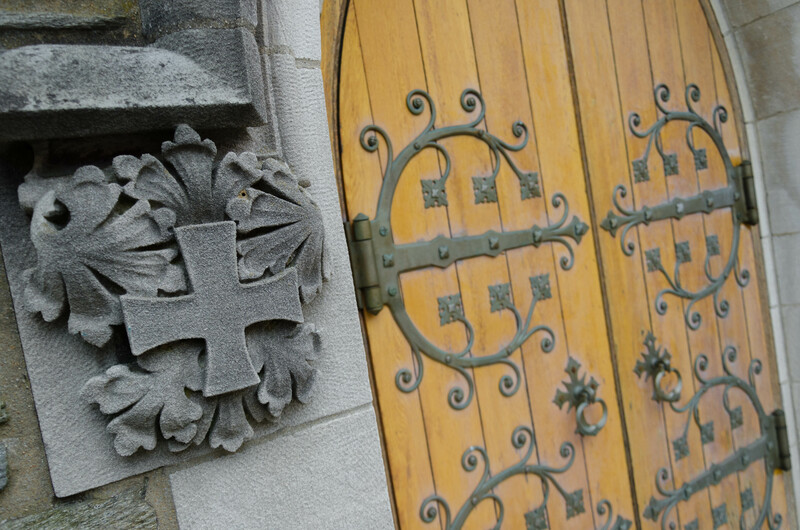 This door, which acts as the Church road portal for the Episcopal church, almost audibly begs to be photographed. Yet, whenever I’ve be privileged to gaze on it’s beauty I’ve either been driving from point “a” to point “b” or been on task and without my camera 1. This past week I finally responded to this door’s mocking. After dinner a friend of mine and I grabbed our cameras and drove up to Moorestown. The first stop on the photo walk was the door. It wasn’t the only subject for my walk, some of my other images can be found in my Flickr feed, but it was the one I enjoyed the most. The image below is my favorite from the entire set. It manages to capture both the excellent door frame and the exquisite metalwork of the hinge (which looks like an “E” from some fairy-tale book). The strong angle gives the image an almost surreal feel. I’ll probably be playing with this some more in Lightroom so I can further accentuate it’s unique angle and field, but here is the image with nothing more than “straight” developing. I thought that the camera was attached to you.